Organic shopping bags are not only fashionable but they’re also environmentally friendly and allow you to promote your company in a socially responsible way. Jute is a natural fiber the grows quickly and consumes carbon dioxide at a rather fast rate as it grows, making this a renewable resource that removes potentially harmful greenhouse gases from the atmosphere. 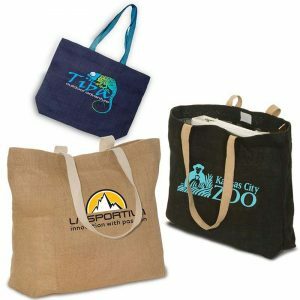 Branding our Eco wholesale bags with your organization’s logo spreads your company’s message and increases your visibility while also letting everyone know that you are doing your part to protect and preserve our planet. Order our natural jute bag to be imprinted with your logo today and you can get these bags into your customer’s hands in as little as two weeks. We work directly with the factory which allows us to save time and money. We in turn pass this savings along to you. If you want to further customize your bag check out our overseas production for available options and pricing.